QUIET Listing! NOT in the MLS. Available by appointment only! Set on a premium, private lot, this gorgeous end-unit home offers the ease of low-maintenance, turn-key living without sacrificing space or amenities. 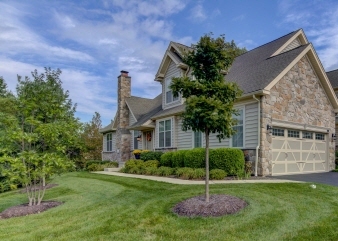 Nestled in the back of the community, this stunning home features a private side entry and backs to deeded open space. With no detail overlooked, these original owners have tastefully appointed this home with more than $120,000 in options and upgrades including gleaming hardwood floors throughout the main living level, a gourmet kitchen with stainless appliances, granite countertops and breakfast bar, a fabulous sunroom addition, an expanded deck, and a huge finished basement with a third full bath!